Insulating your home is an investment that will pay you back long-term, not only in energy savings but also in your family’s comfort. 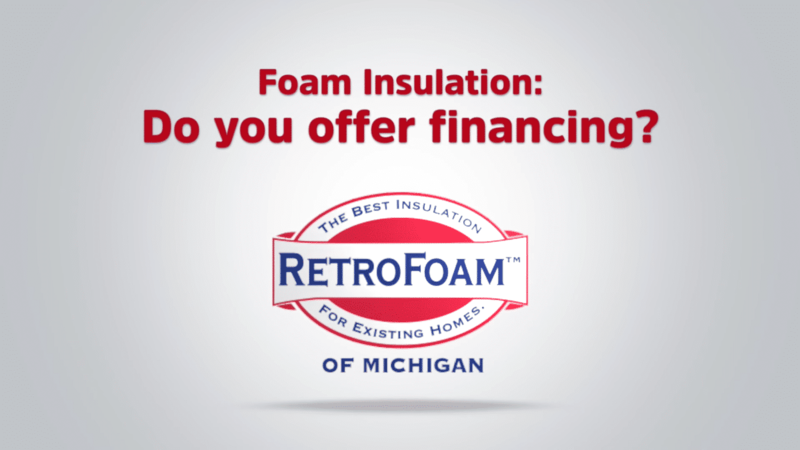 Does RetroFoam of Michigan Offer Financing? There are a few ways to pay for your home insulation project. After you decide to move forward with RetroFoam of Michigan we ask for a deposit to get your install date on the schedule. After the work is done, our crew will collect the balance via check or credit card (Visa, MasterCard, or American Express). Some customers prefer to finance their home insulation. Many contact their bank or credit union to inquire about available financing options. Others prefer to apply for convenient 12 month same-as-cash or traditional term loan financing through EnerBank USA. The approval process is quick and simple, and a good option for many of our customers. Michigan Saves is another financing partnership that can be considered when insulating a whole house. They offer convenient low-interest loans for qualifying energy efficient home updates, including insulation. RetroFoam of Michigan is an authorized Michigan Saves contractor. To learn more about financing your home insulation project, please ask your estimator or give us a call at 866-900-3626.